We had a great time filming our I & II Thessalonians Unit Study. We re-enacted lots of skits, referred to a map of Thessalonica, and baked a cake to represent the Day of the Lord. When looking at the overview for I & II Thessalonians, we saw that one of the main themes was the Day of the Lord. We filmed Jesus and an archangel up on a chair holding some clouds while the archangel blew the shofar, the Jewish trumpet. The dead in Christ rise first to meet the Lord in the air, so we had a black gravestone made out of black poster board. One of my sons floated up out of the gravestone to meet the Lord in the air. You see him in the clouds with Jesus and the archangel. 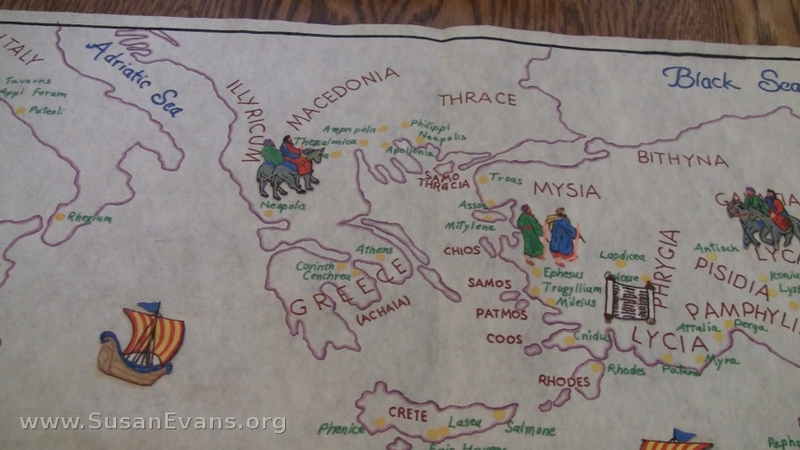 We looked at a map of where Thessalonica was located, which is in Macedonia north of Greece. I have a beautiful biblical map that a woman from my mom’s church gave her. It was created with markers on a large piece of felt. You can easily look in the back of your Bible to find a map of Paul’s missionary journeys, and you will find where the city is located. We also make a cake that represented the Day of the Lord. It is a cloud shape with white frosting. 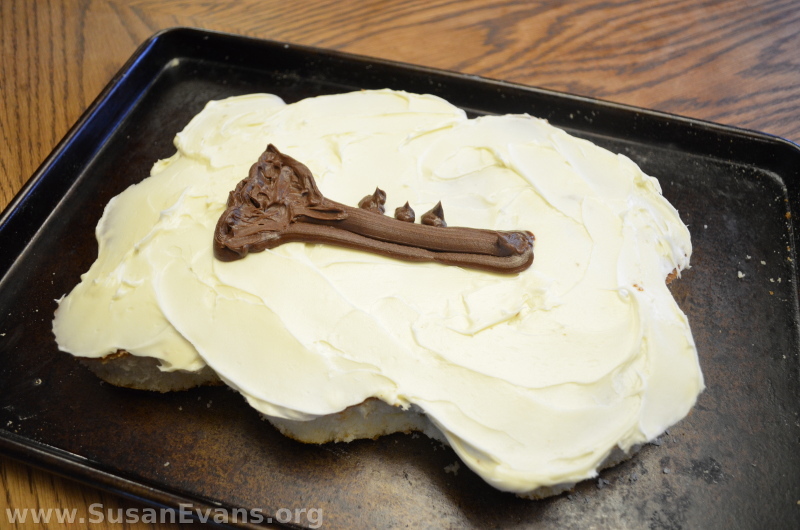 A trumpet shaped by chocolate frosting is on the top. This was the culminating activity for our I & II Thessalonians Unit Study. 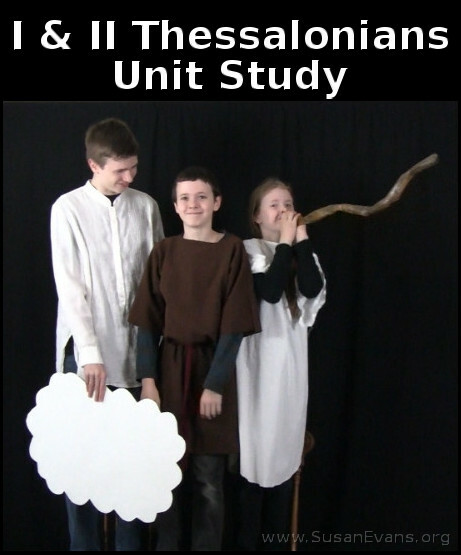 If you enjoyed these activities, you will love the Bible section of the Unit Study Treasure Vault that includes unit studies for every book of the Bible! 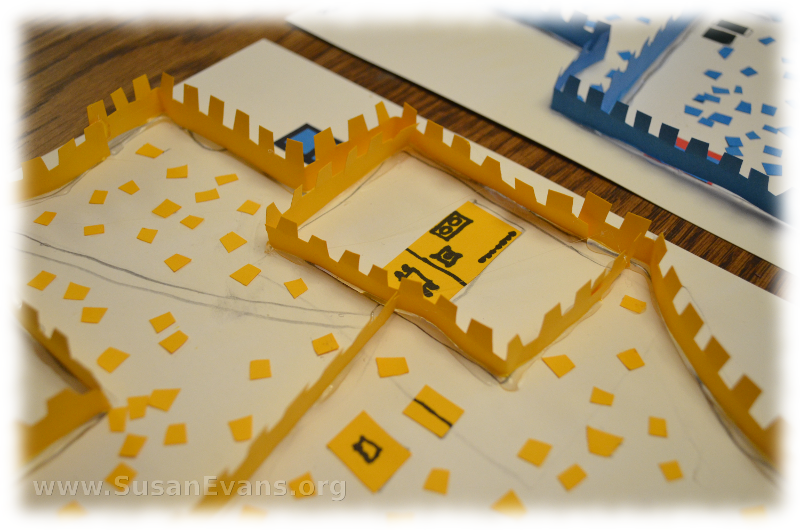 When my children made a 3-D Jerusalem model out of paper, they learned a lot about the layout of Jerusalem while constructing the city. I decided to use card stock paper instead of construction paper because it’s stiffer. I also decided to use hot glue instead of white school glue because the walls instantly stood up. 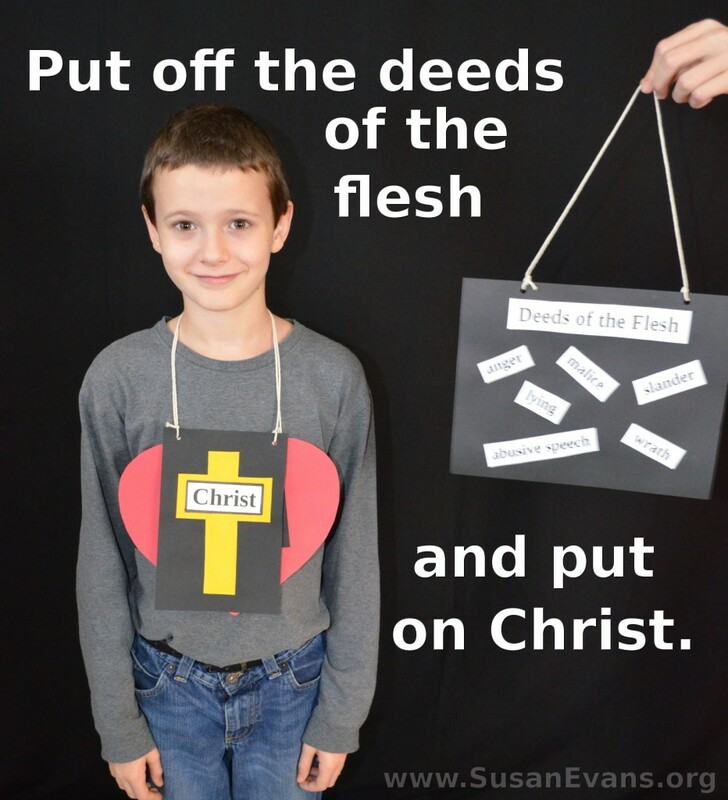 You can also use white school glue like I did with my Bible class at the Christian school where I taught years ago. It will just take longer for the glue to dry, and meanwhile, the walls might fall down if you don’t hold them up for a few minutes. It’s definitely easier with hot glue. 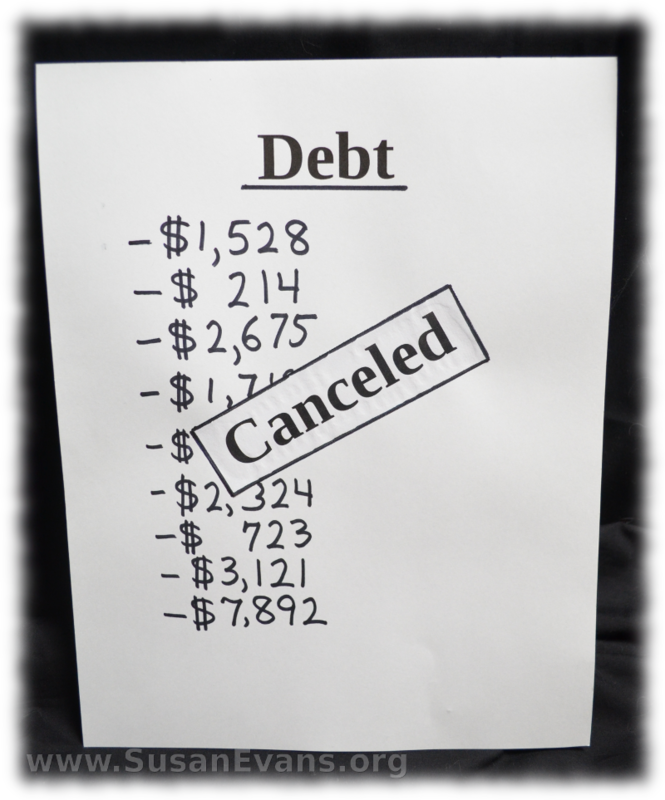 Start with a piece of white card stock paper. Look up a map of Jerusalem, either from a book on your shelf, the back of your Bible, or the internet. Grab a pencil and sketch the outer outline of the city. Then fill in the major parts of the city, especially the wall that divides the city and the wall around the Temple. 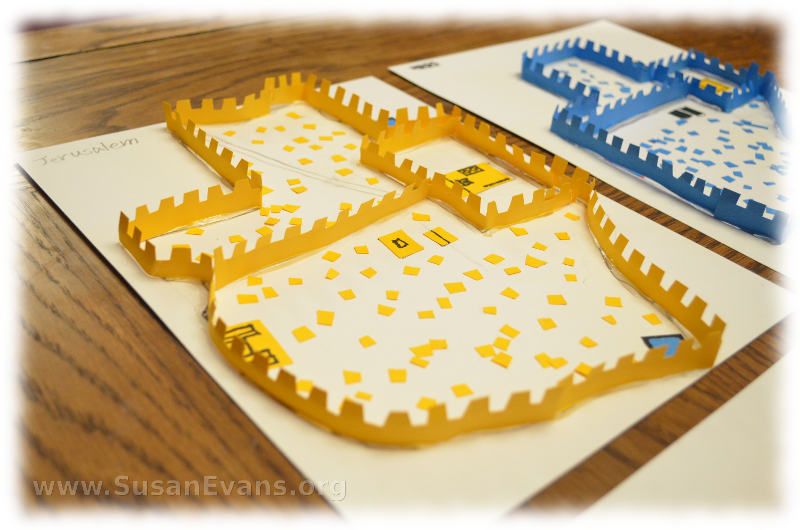 You can cut out pieces of card stock paper to represent the Temple, Herod’s palace, and two pools of water. 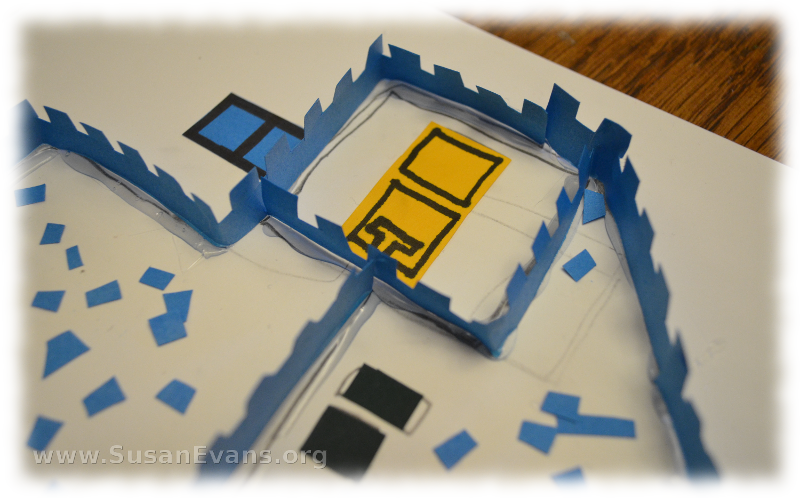 Then cut strips of card stock paper, making turrets for the walls. The leftover pieces from the wall were used for the buildings and houses inside the city of Jerusalem. 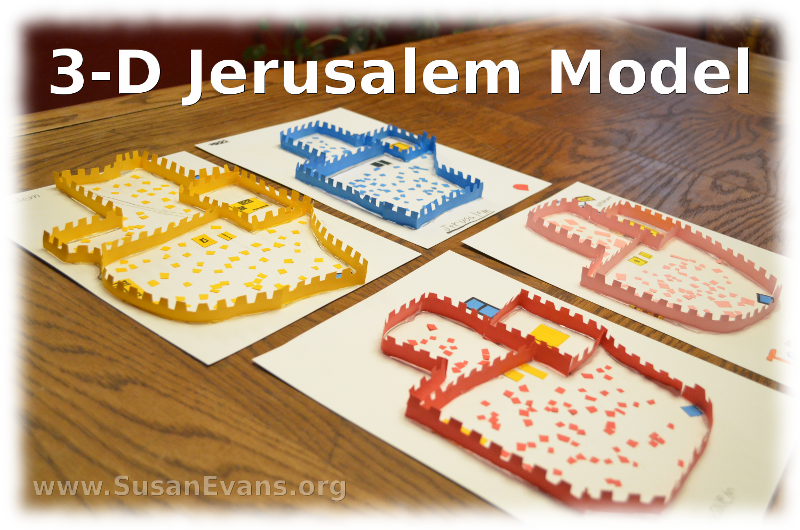 Now your 3-D Jerusalem model is complete. You can use it to tell Bible stories from the time of David all the way through the ministry of Jesus. We constructed this city while studying the book of Lamentations, and we set fire to the city by using red, orange, and yellow tissue paper. We then lamented the fall of Jerusalem before going into exile to Babylon. 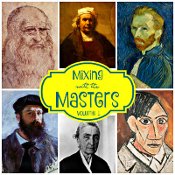 If you enjoyed this activity, you will love the Unit Study Treasure Vault. Why not join the Vault today and bring life to your Bible lessons? We read the story from Acts 2. 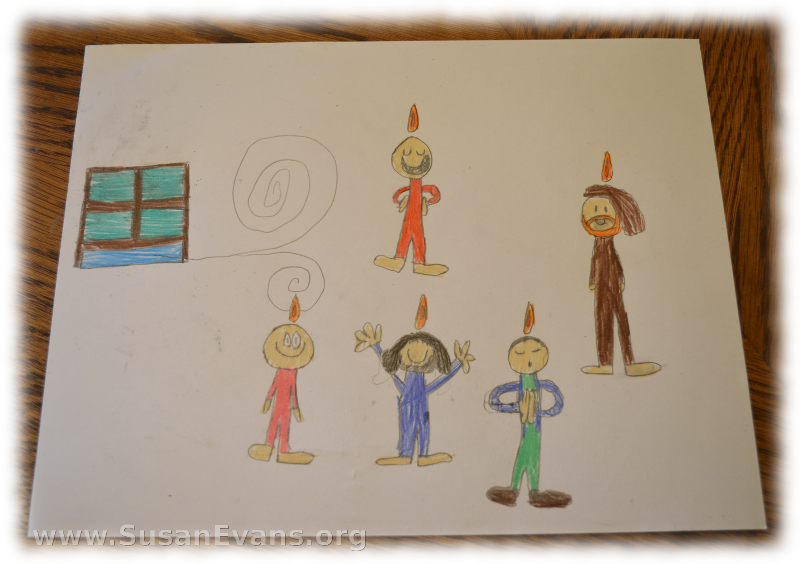 We drew pictures of Pentecost. We talked about being filled with the Spirit. We compared the Spirit to the wind. 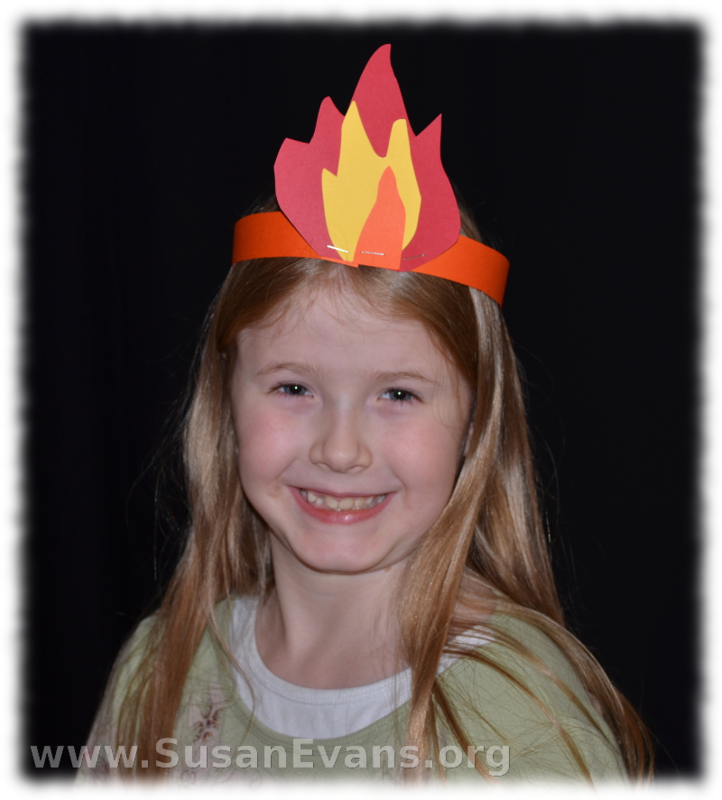 We made a fire headband to represent the tongues of fire. 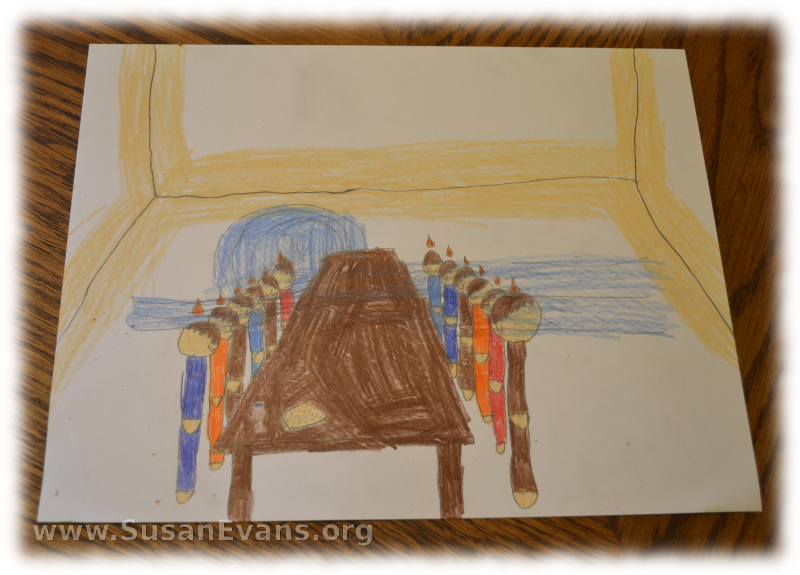 We watched a video about Pentecost. First of all, we read the story of Pentecost from Acts, chapter 2. Pentecost was 50 days after Passover, which was when Jesus was crucified. Jesus appeared to the disciples for 40 days; then He went up into heaven. He told them to wait in Jerusalem for Holy Spirit to come. When the day of Pentecost came, a noise like a violent wind came rushing into the house where the believers were congregated. Over each person’s head appeared something that looked like a tongue of fire. The believers felt a rushing of the Holy Spirit as He descended upon them. And they began speaking in other languages that were understood by the people outside. As a result, Peter stood up and gave a sermon that caused 3,000 people to be saved! 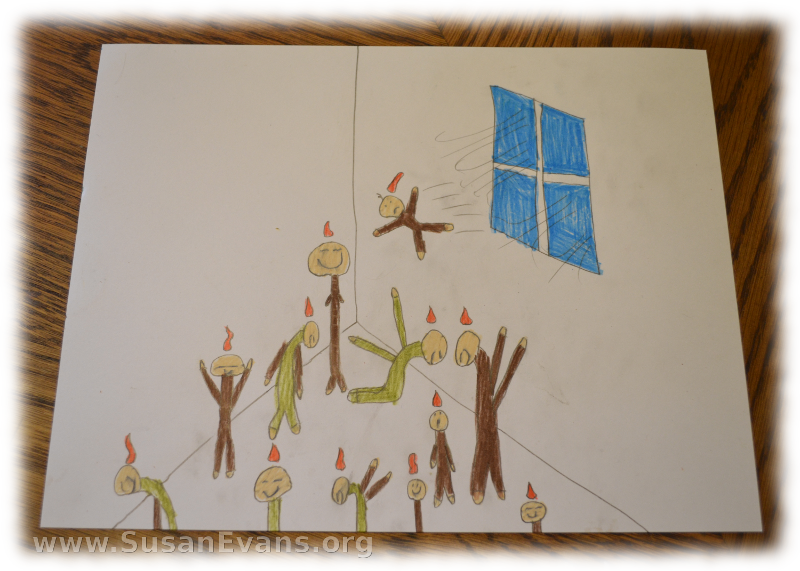 My children drew a wind, and tongues of fire landing on each believer. The people experienced joy as they were filled with the Spirit. 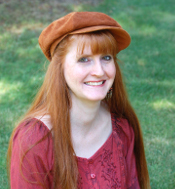 How are the Holy Spirit and a wind similar? You see what it does (its effects). It goes where it wants to go. It has power that is somewhat uncontrollable. You hear the sound of it. Sometimes it’s gentle, sometimes it’s strong. Refreshing; you can enjoy it. You don’t walk against it but with it. 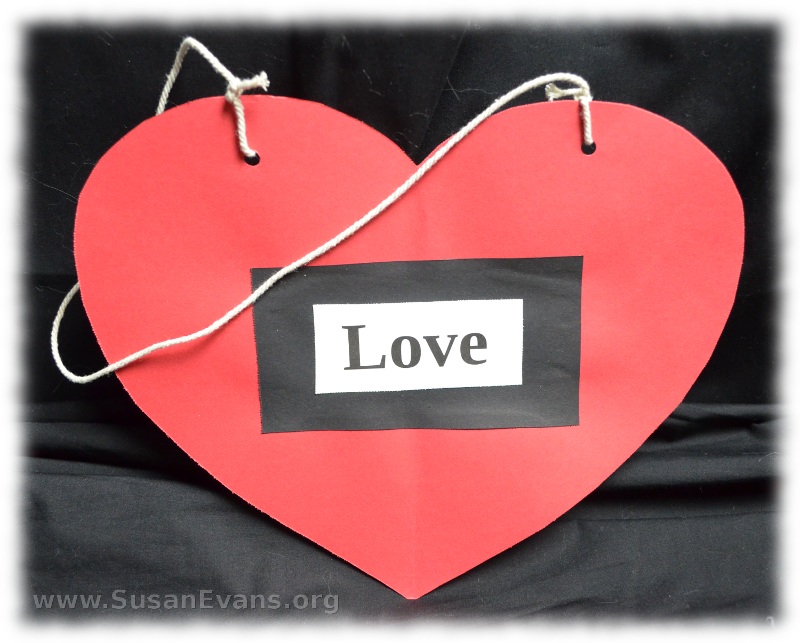 We talked about how to be controlled by the Spirit of God, and how to pursue holiness. We made a headband with a strip of orange card stock paper stapled together. For the flame, we cut out flame shapes out of red, yellow, and orange card stock paper, We attached it together with staples. 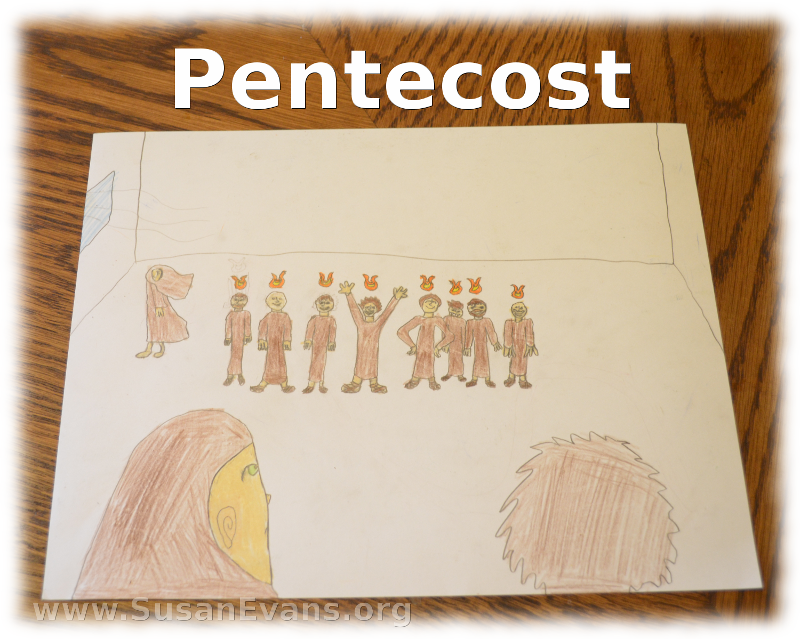 Here is a video clip about Pentecost, so you can picture it better. 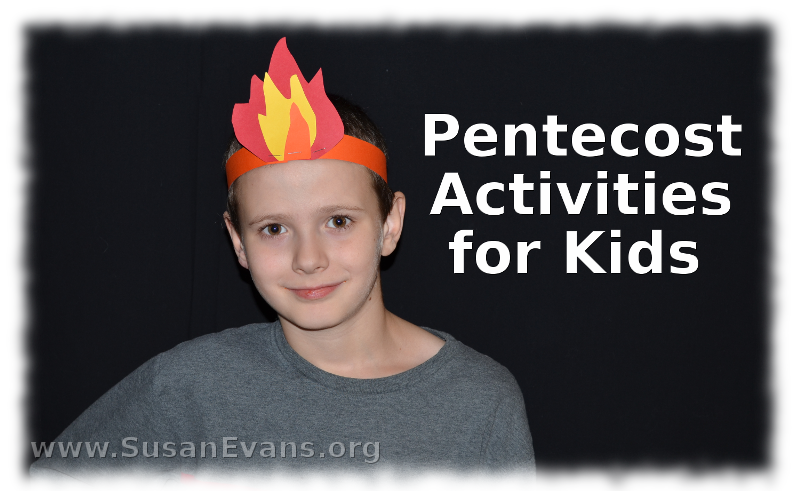 If you enjoyed these Pentecost activities for kids, you will love the huge Bible section of the Unit Study Treasure Vault!